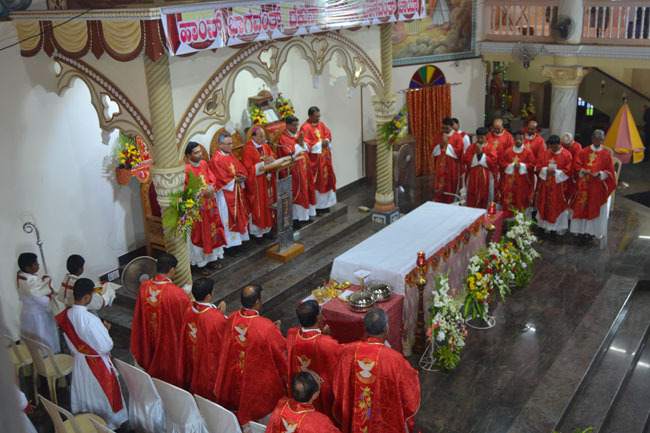 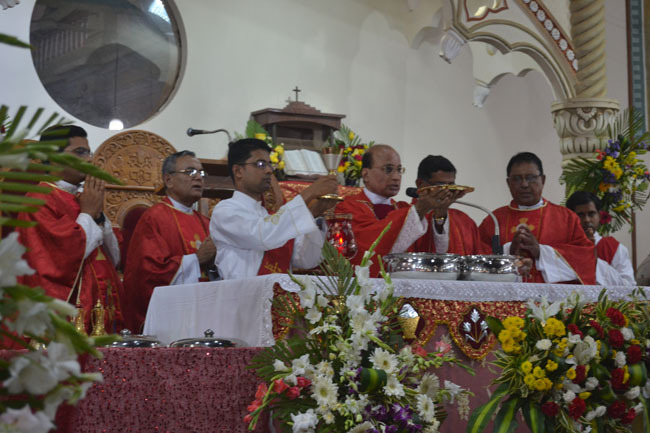 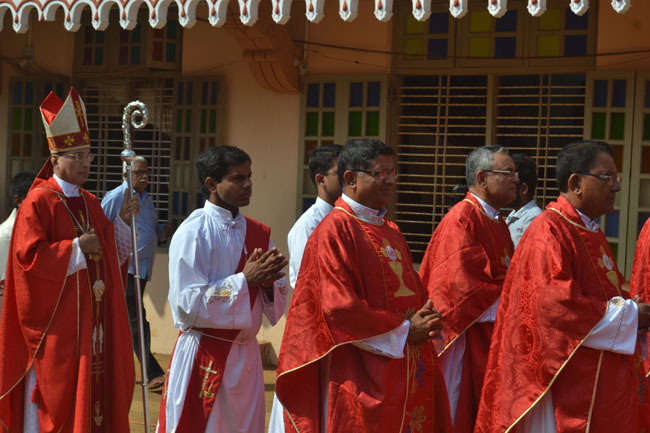 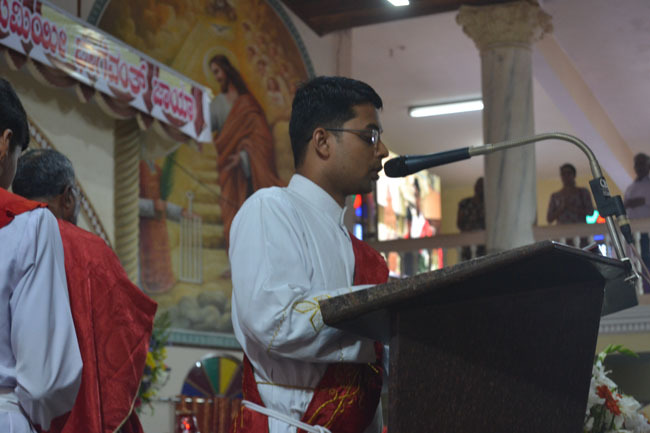 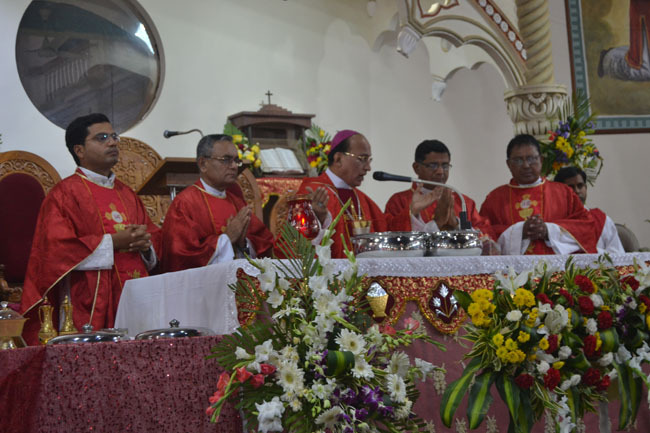 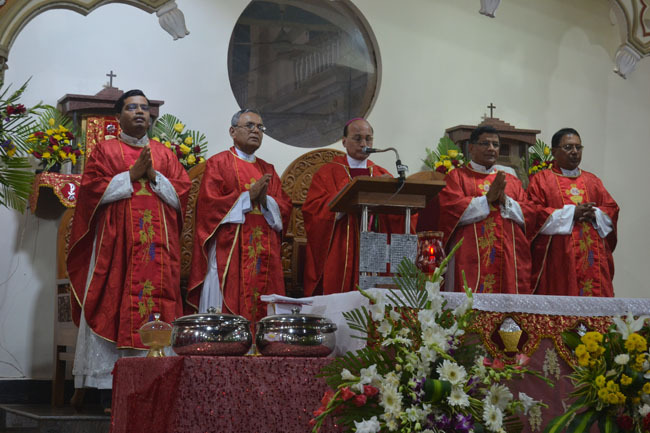 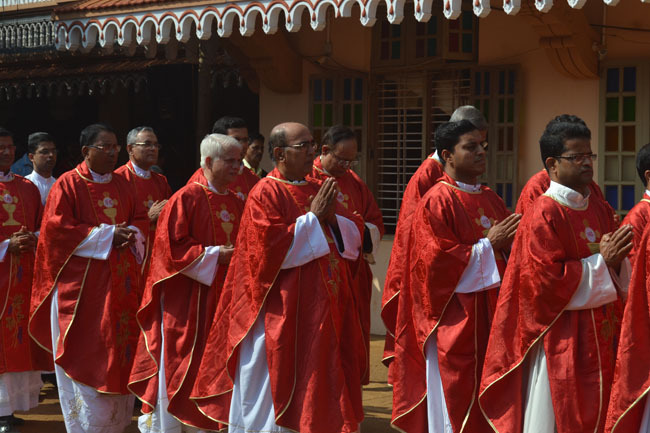 Karkala-Attur, 31 Jan: On the fifth and final day of the five days long annual feast of St. Lawrence Basilica, Most Rev Dr Gerald Isaac Lobo, Bishop of Udupi Diocese concelebrated the feast mass along with Rev Fr Joswey Fernandes-Dean of Karkala Varado, Rev Fr George D’Souza-Rector of St. Lawrence Basilica, Rev Fr Wilson D’Souza-Parish priest of Bejai, Mangalore, Rev Fr Jencil Alva-Assistant Parish Priest of St. Lawrence Basilica and a number of other priests at 10.30 am. 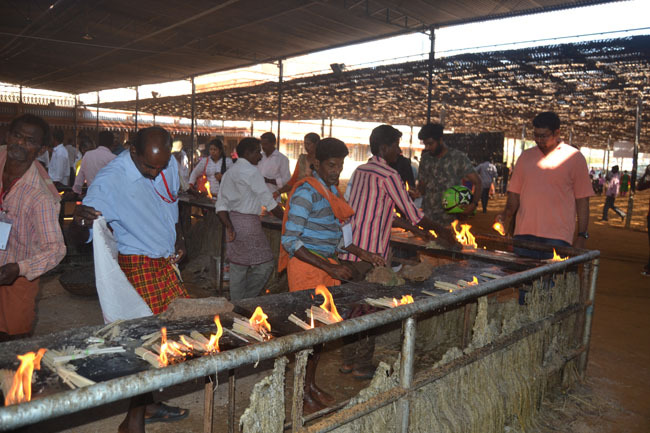 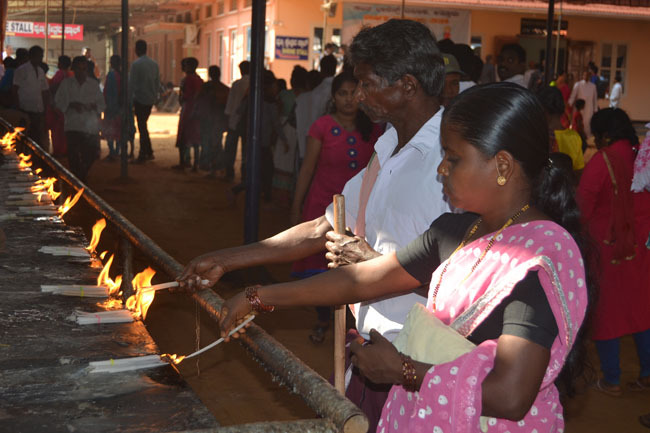 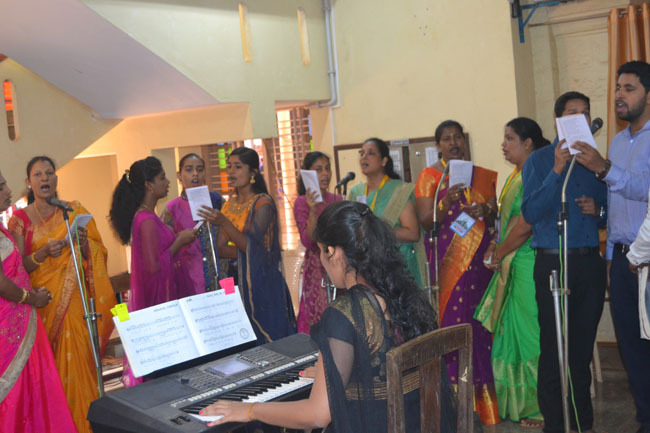 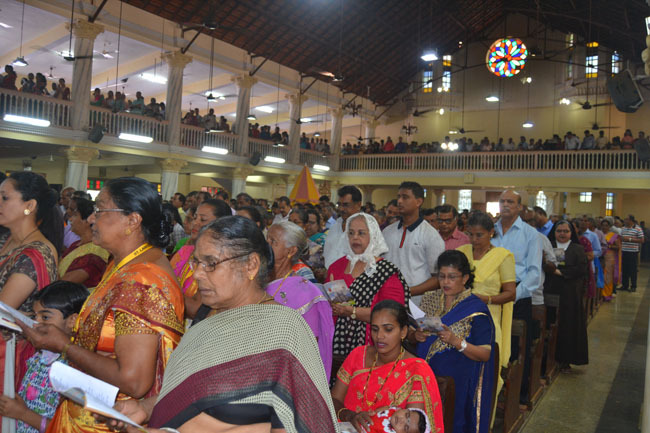 The holy mass was celebrated as the annual feast for the parishioners of Attur which is also considered as the feast of Our Lady of Guide(Giad Mai). 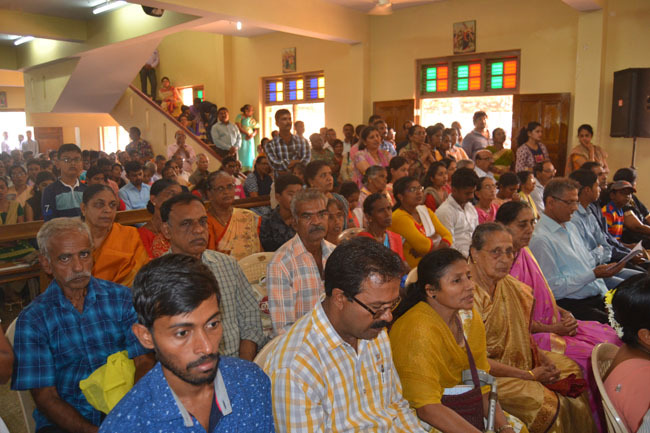 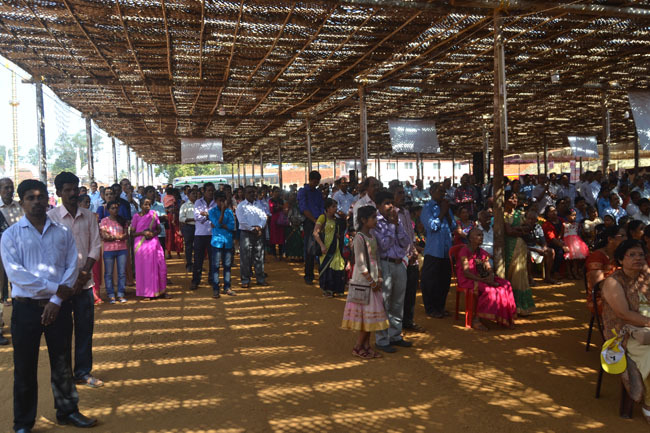 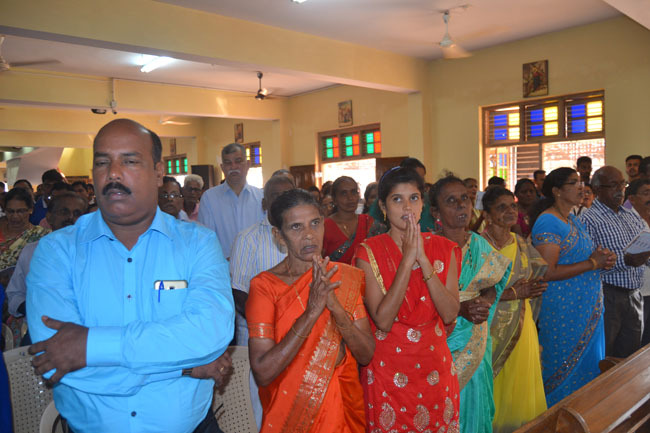 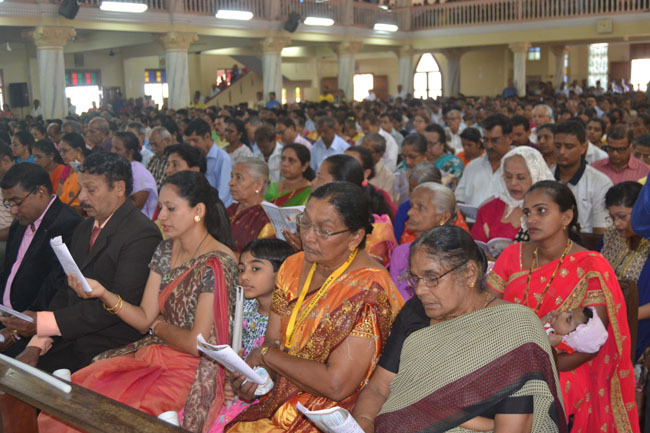 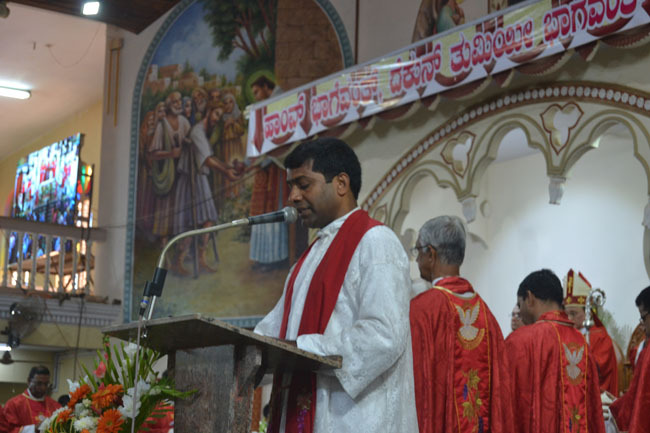 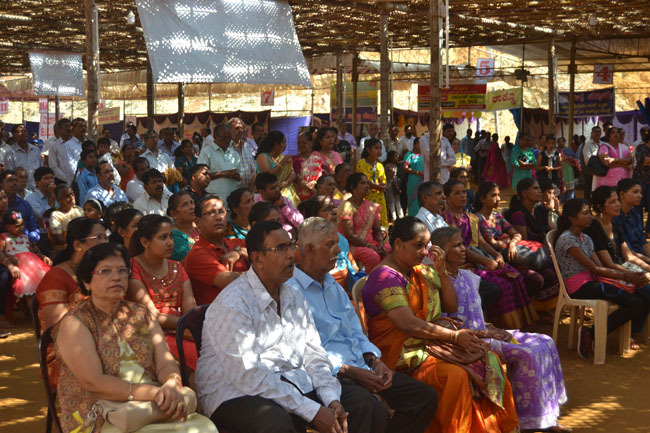 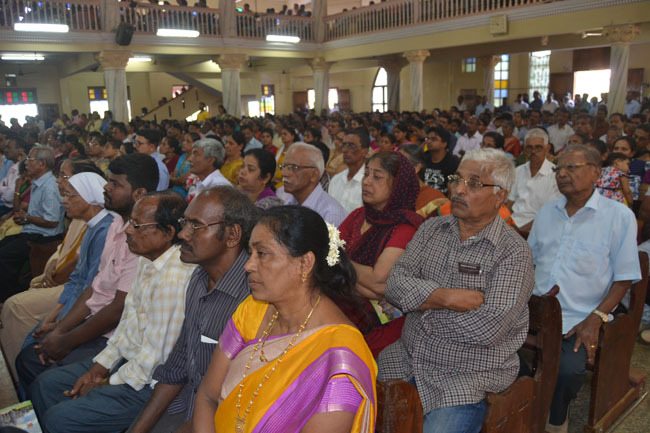 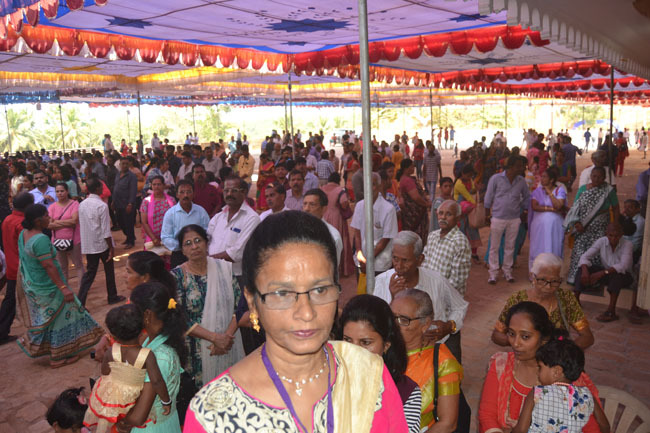 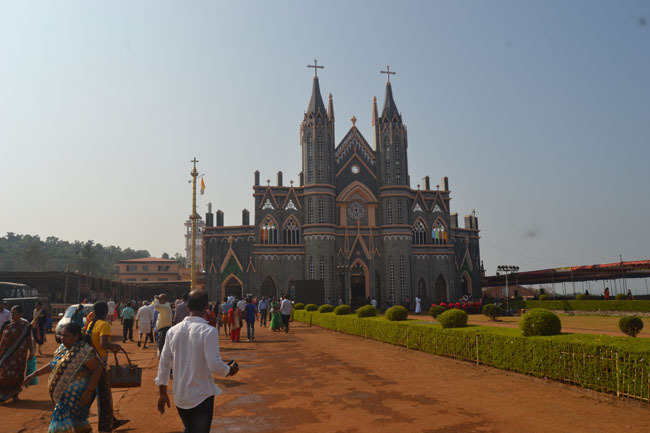 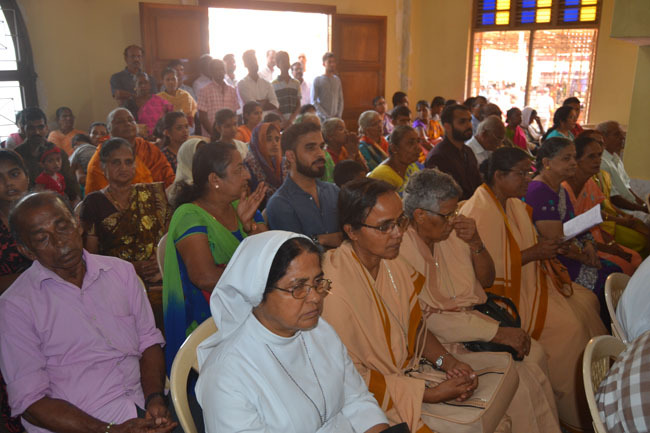 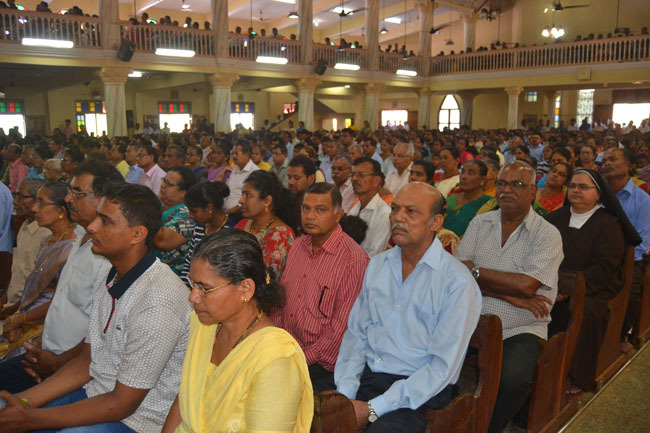 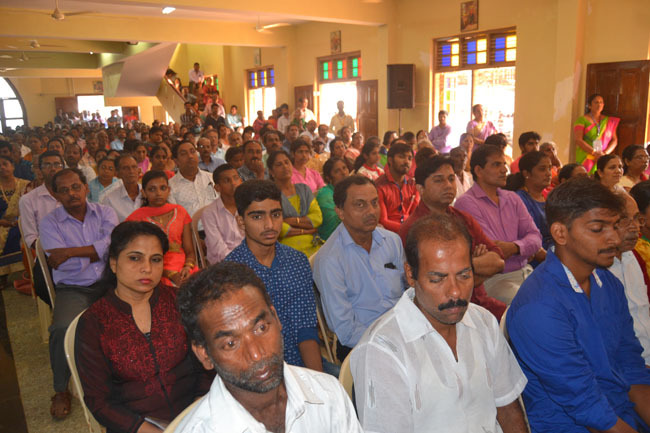 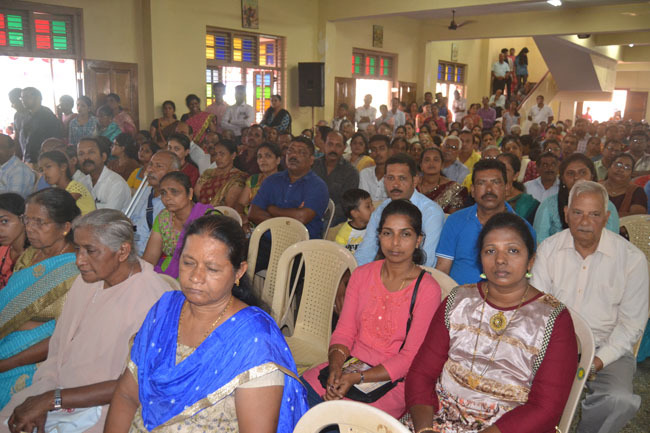 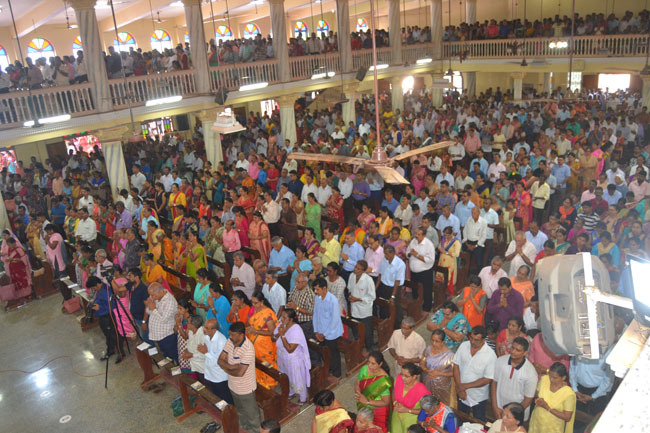 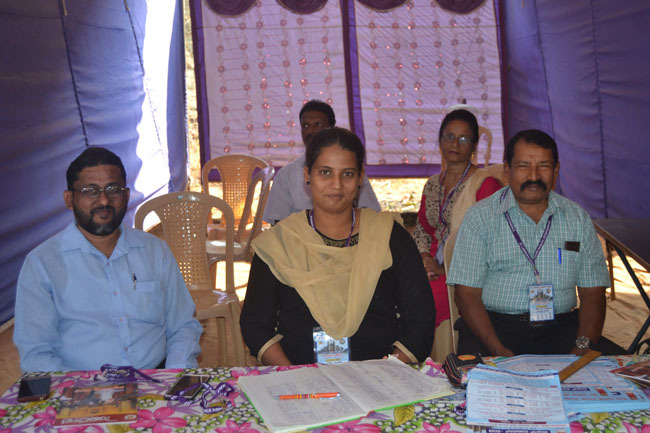 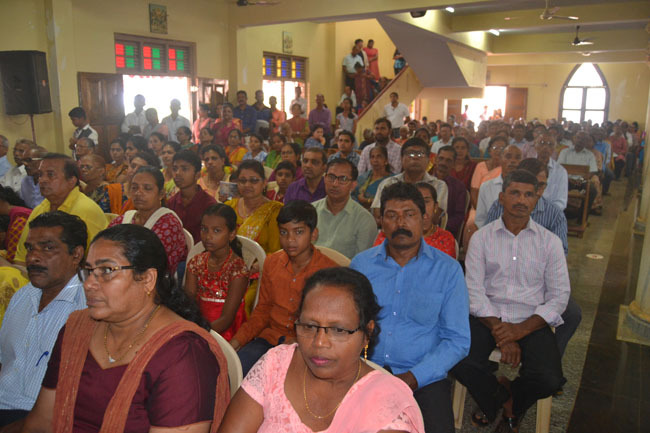 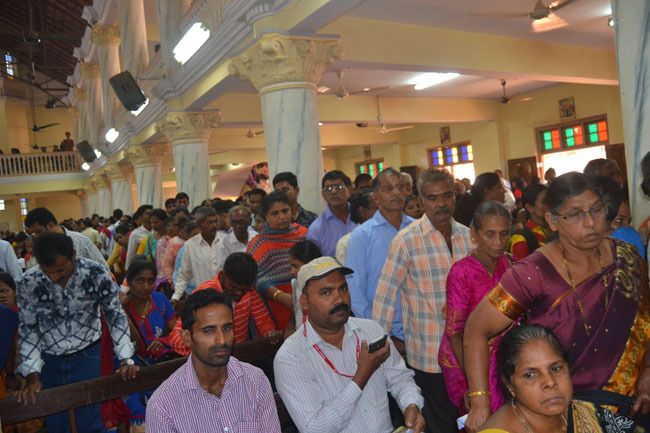 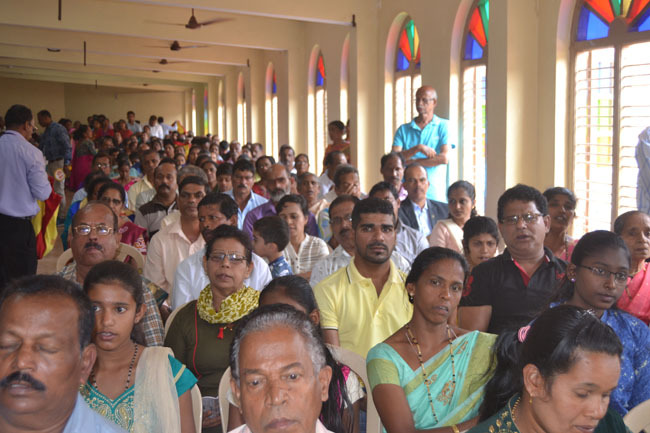 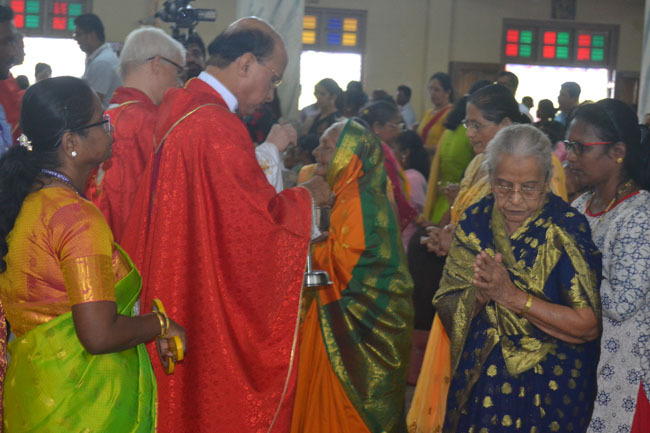 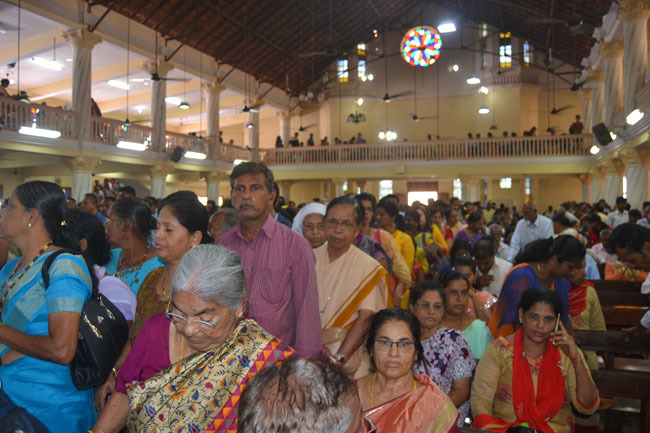 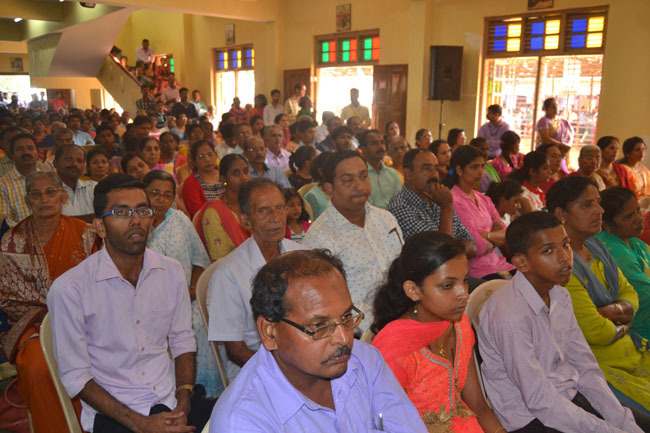 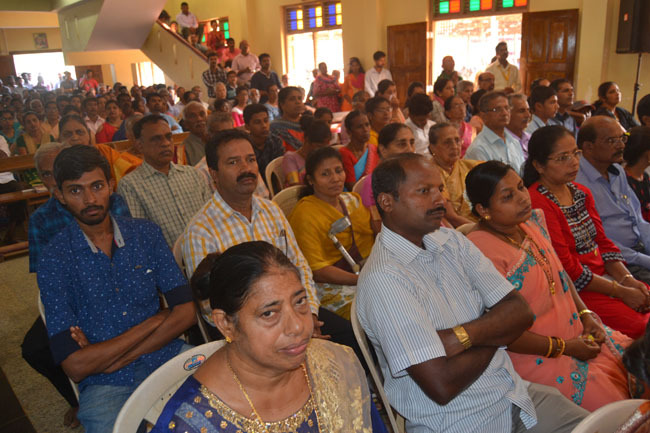 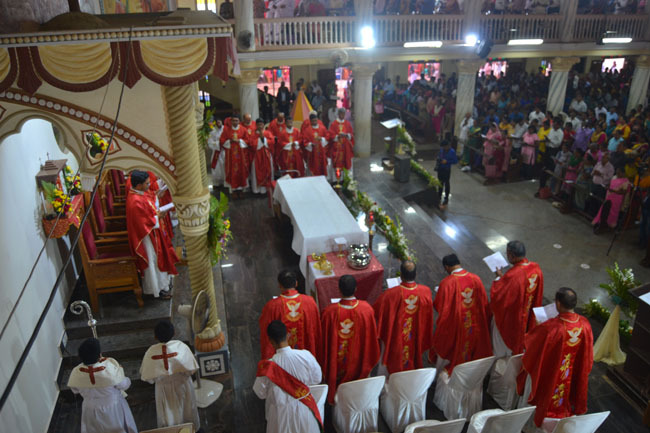 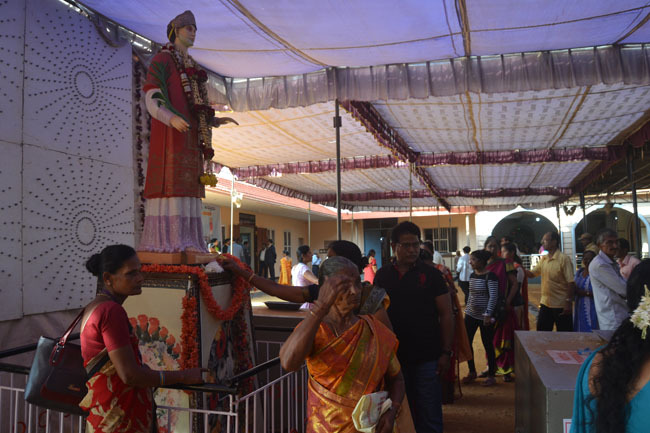 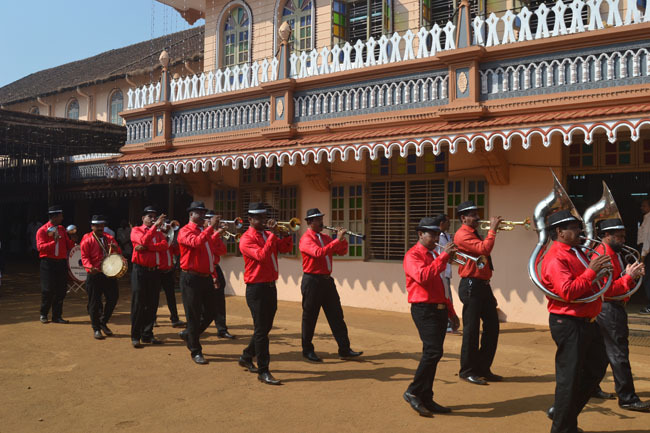 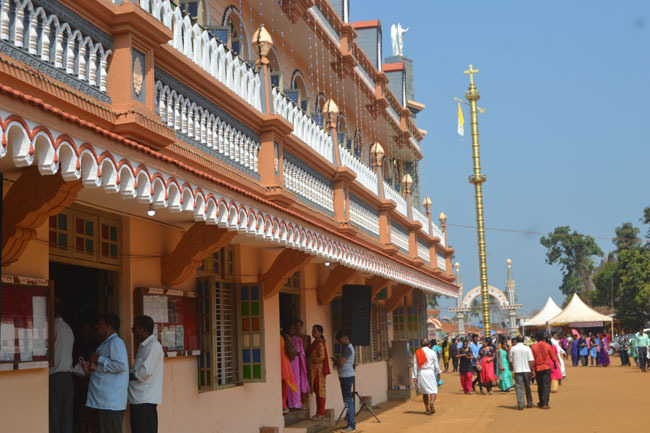 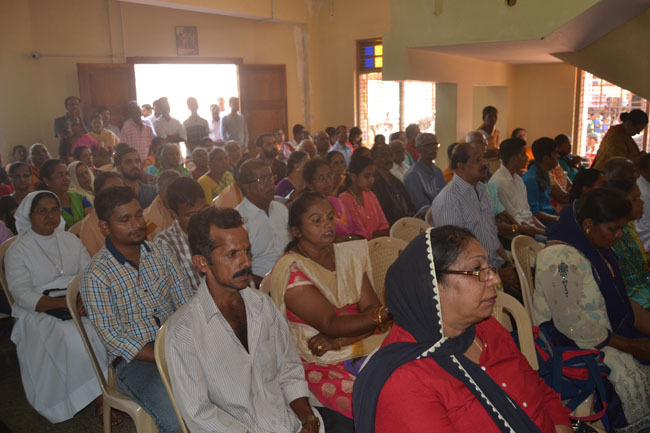 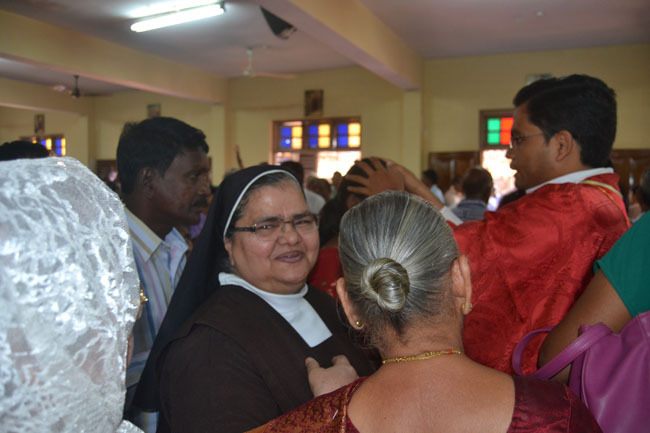 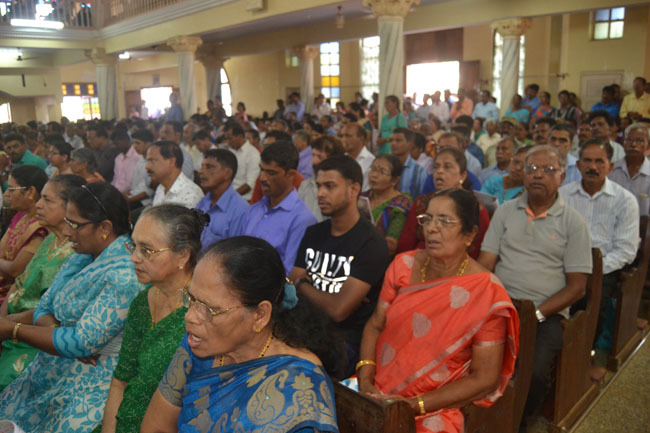 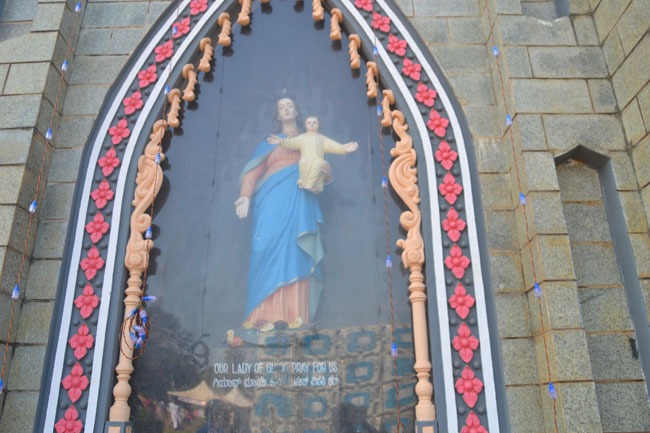 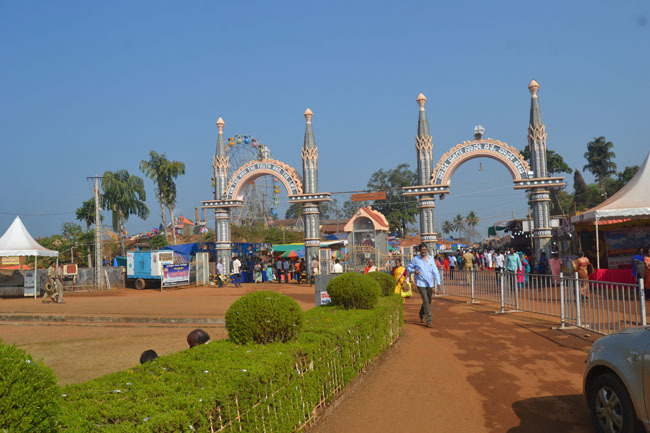 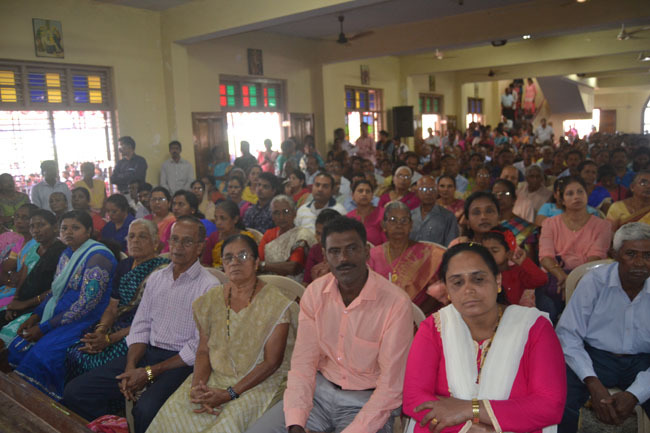 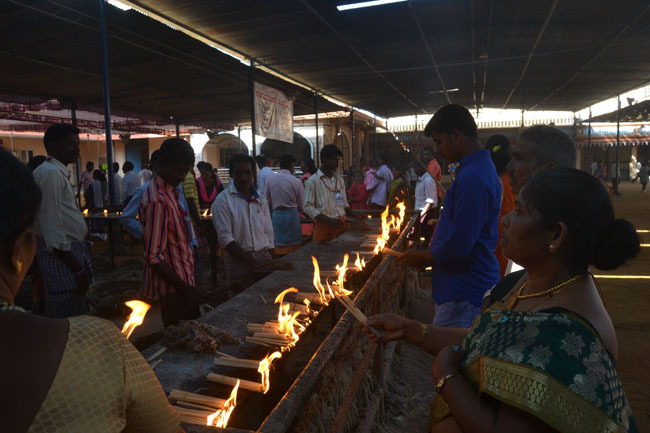 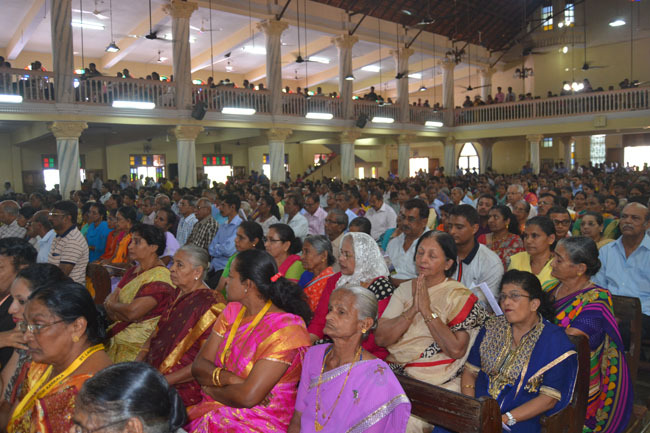 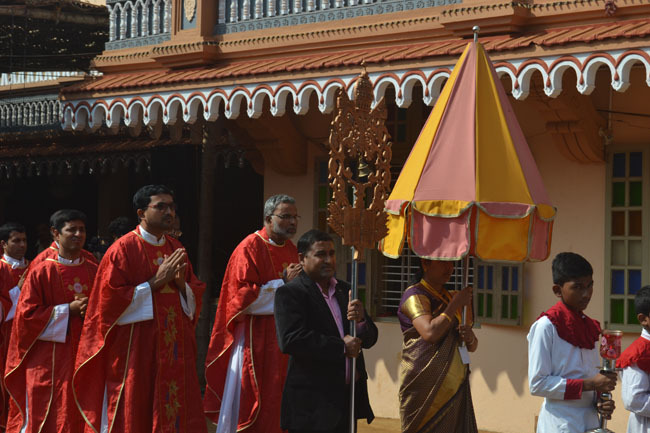 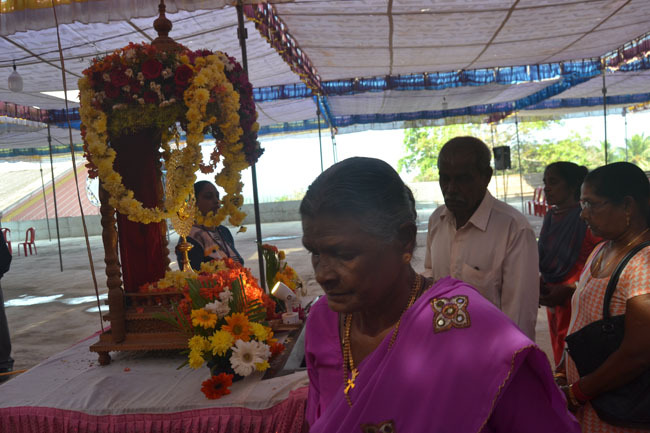 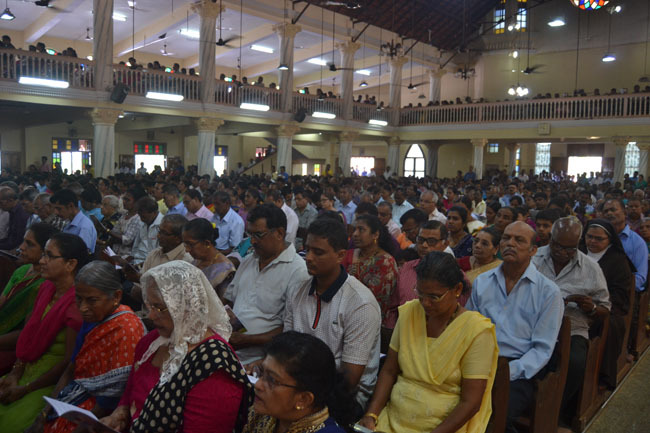 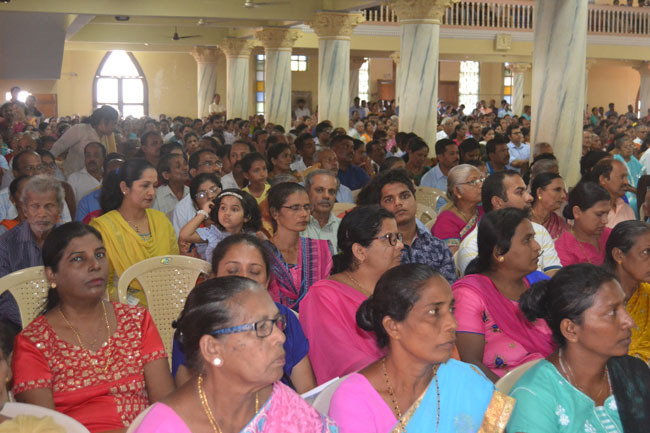 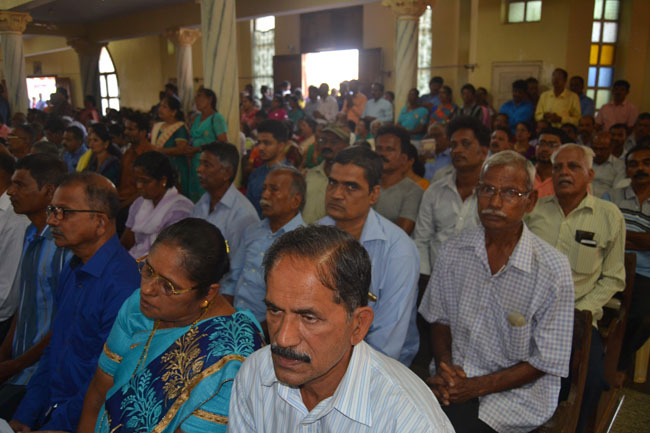 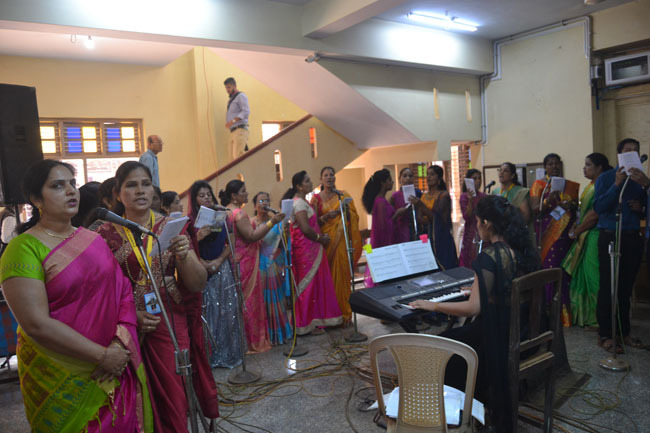 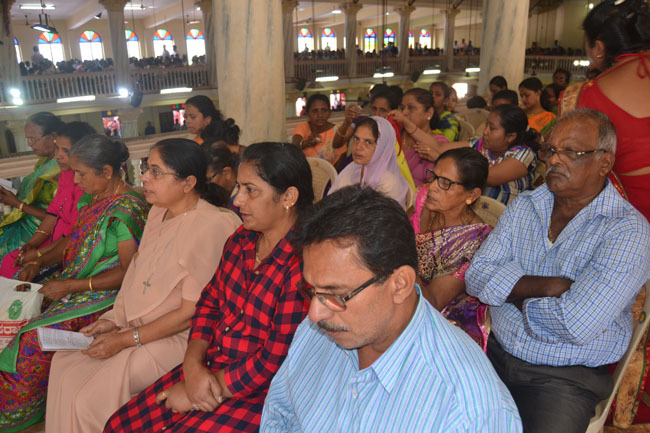 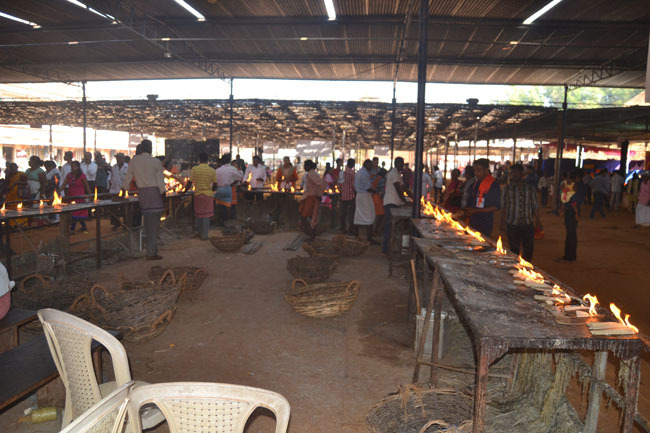 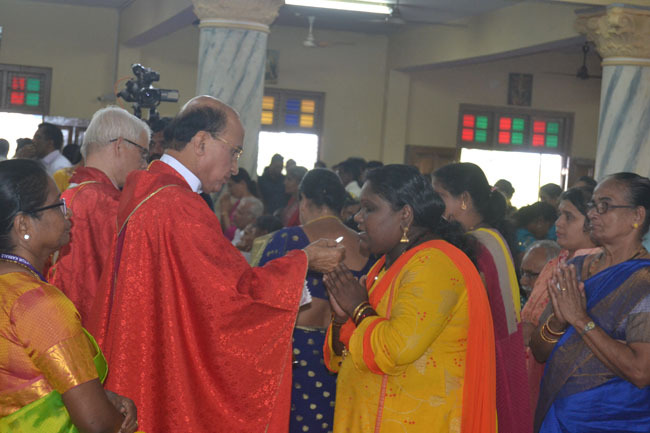 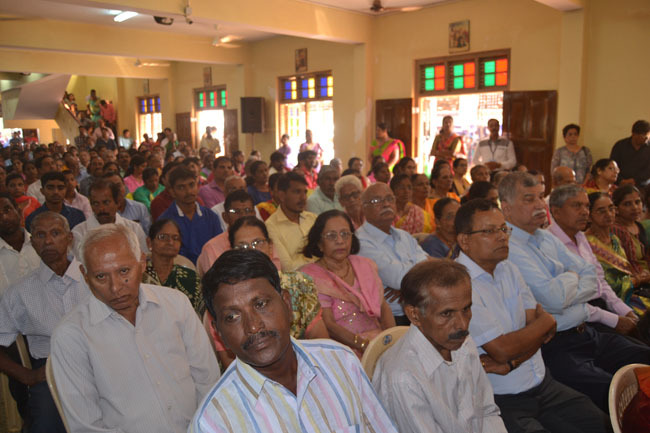 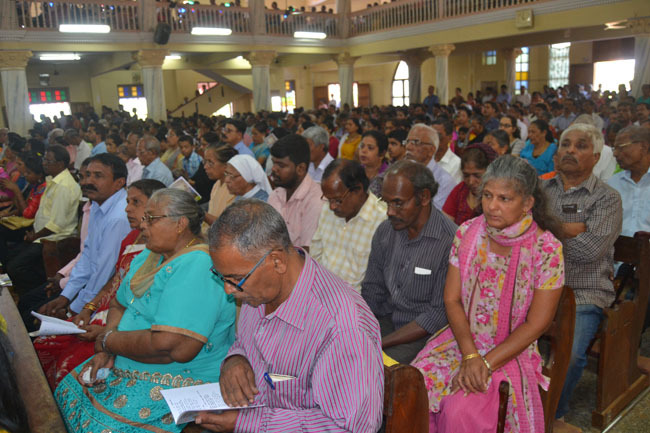 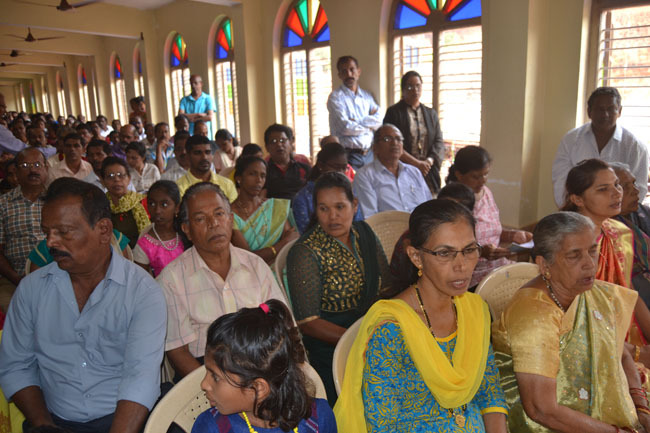 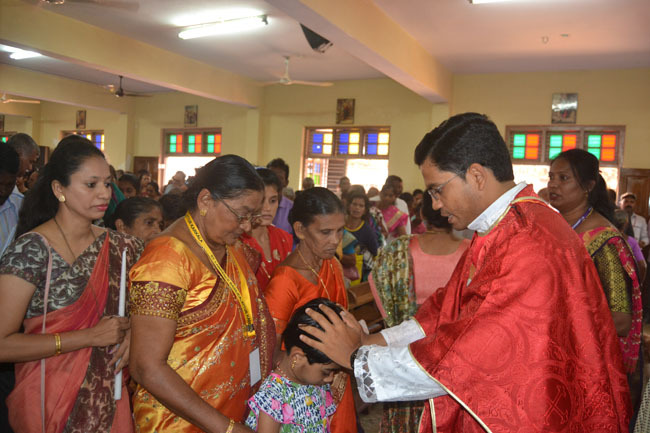 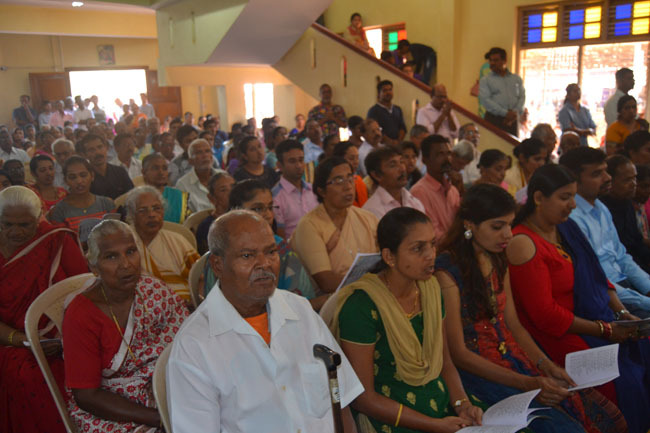 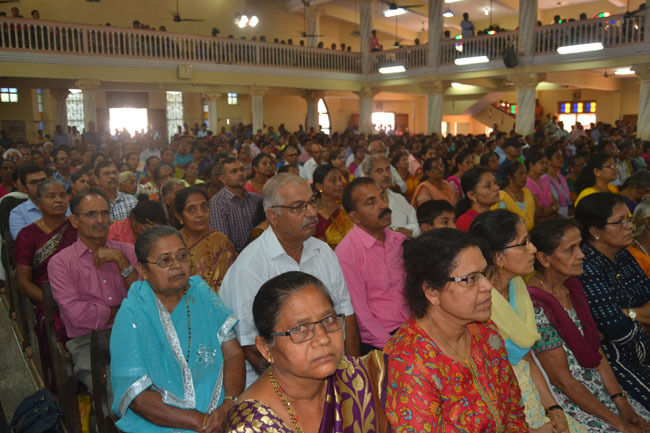 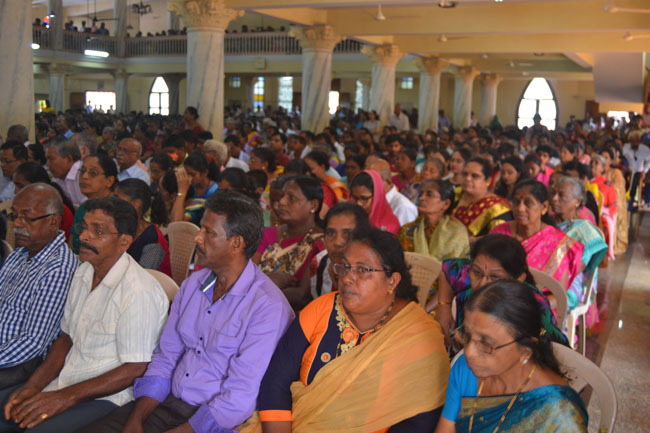 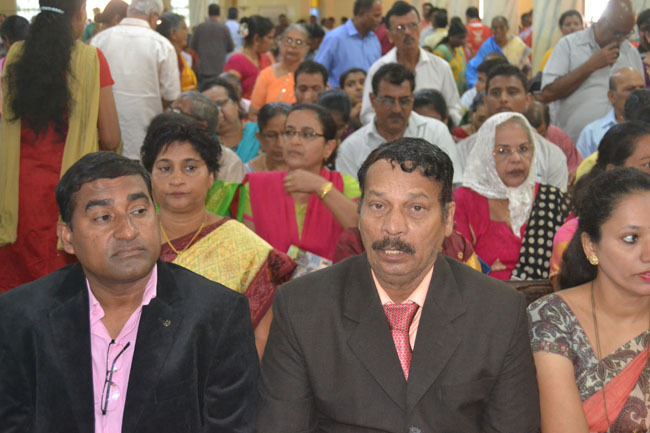 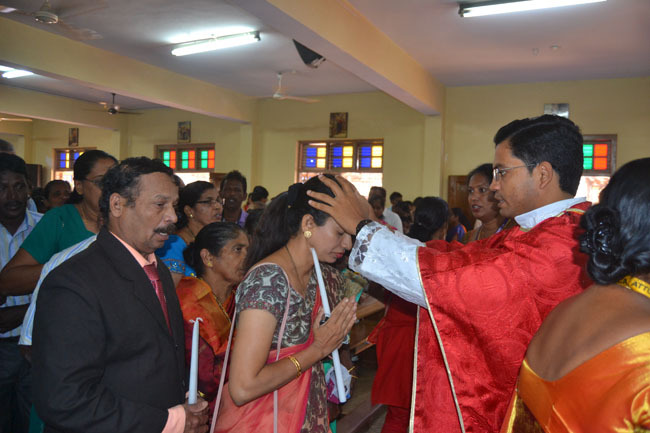 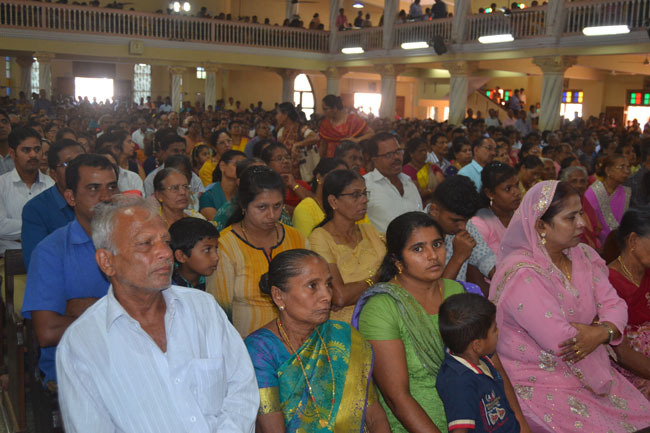 Parishioners of Attur-Karkala as well as devotees of St. Lawrence from different parts of the diocese occupied every available seat inside and outside the Basilica. 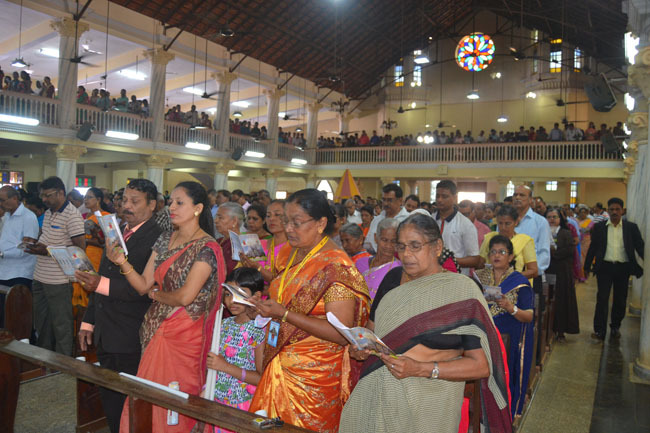 CCTVs on both sides of the balconies of the Basilica and outside enabled the devotees to view and participate in the festal mass. 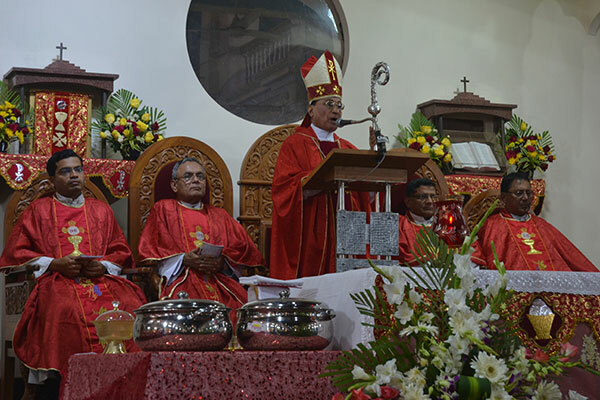 In his homily, Bishop Gerald Isaac Lobo highlighted on the theme of this year’s annual feast “As I am Holy, you too become Holy”. 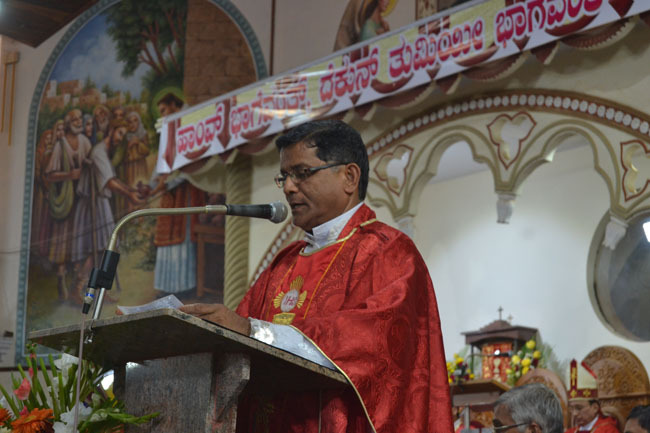 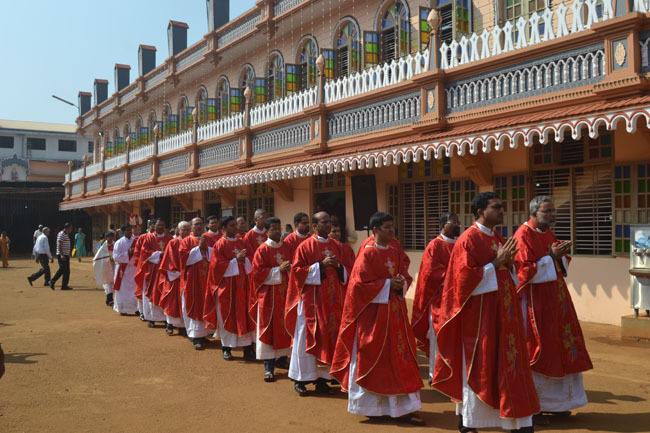 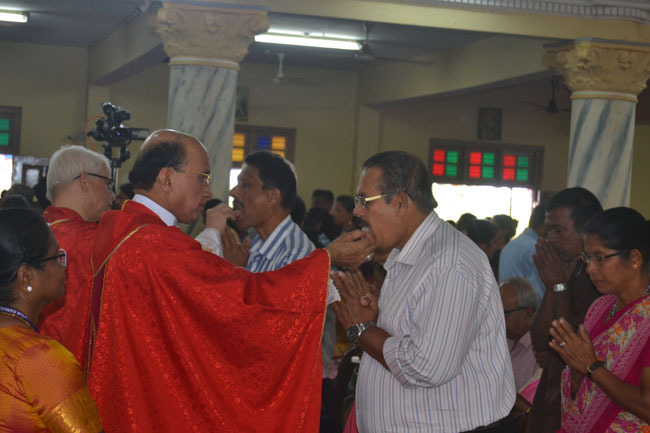 Bishop Gerald Isaac Lobo said that devotees of St. Lawrence have been coming to the Basilica of St. Lawrence at Attur-Karkala since many years to seek favours from the saint and also to pay gratitude for the favour that they had received through the intercession of the ‘Saint of Miracles’. 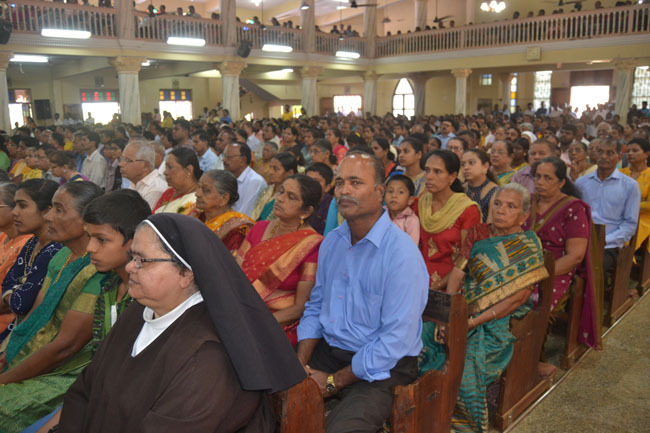 He further said that each and every Christian being baptized is invited by God to sainthood. 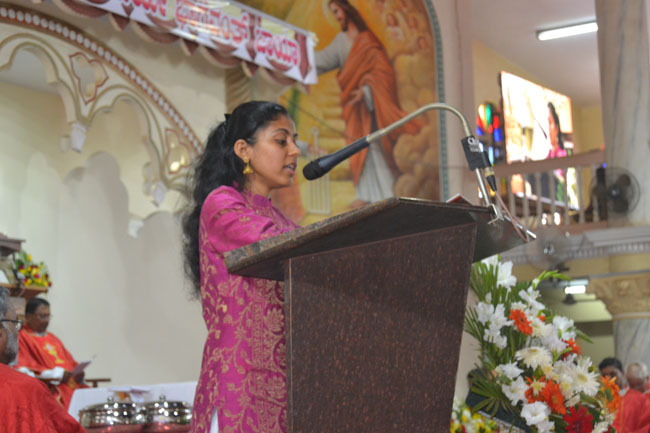 God is holy and is the source of holiness. 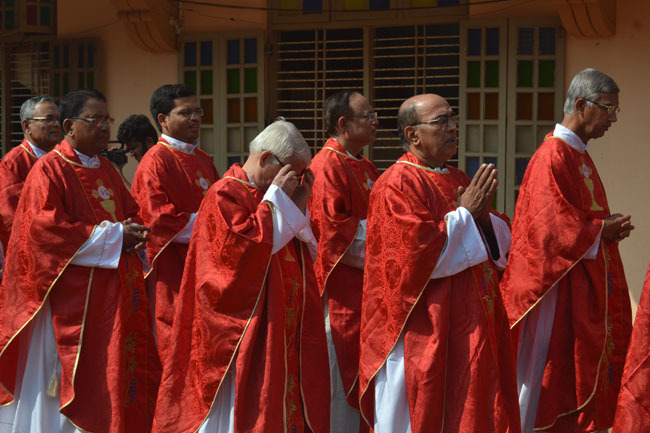 Jesus, through his life, teachings, sufferings, death and resurrection has made all of us partners in holiness. 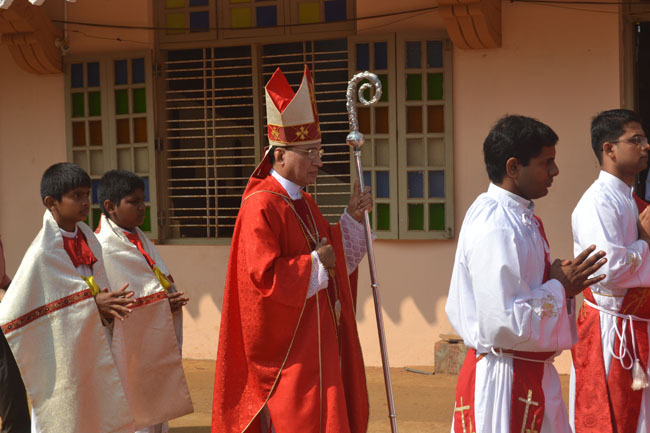 Holy Spirit guides each and every one of us towards the path of holiness. 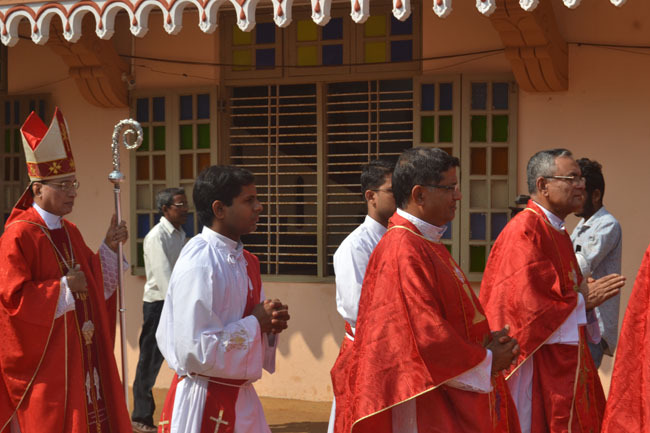 In the words of St. Peter, as God who had called us holy, so also we should become holy in words and deeds. 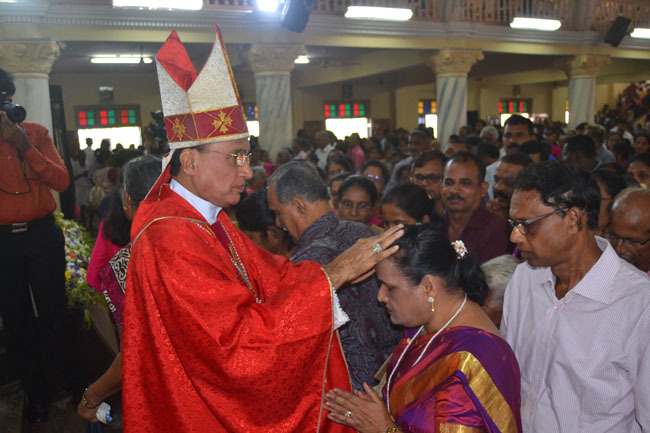 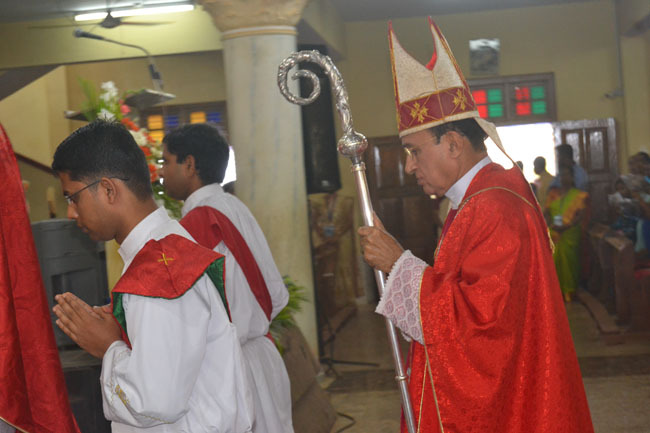 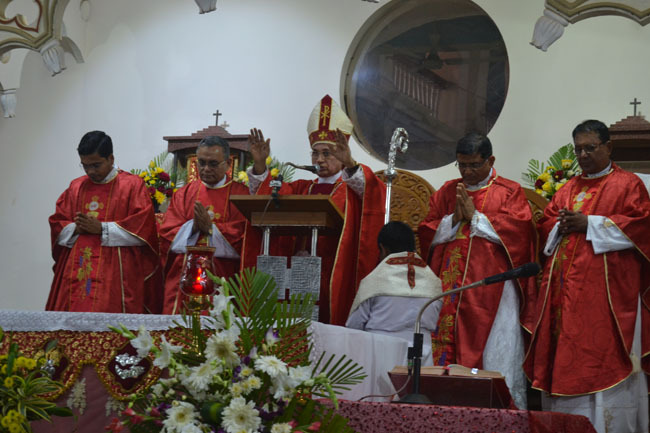 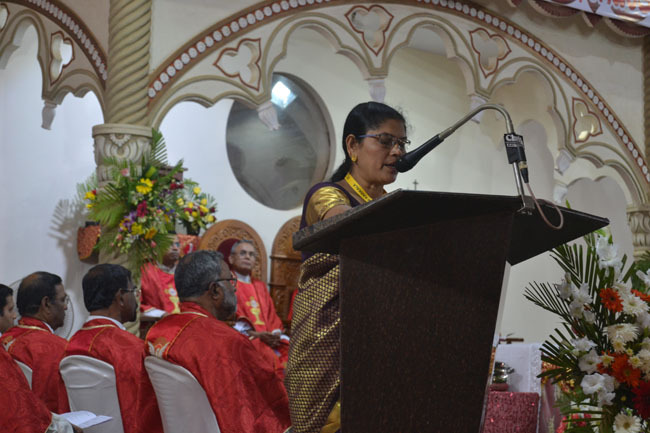 Stressing on the importance and path to holiness, Bishop Gerald Lobo referred to the Gospel of the day, ‘The Sermon on the Mount’ and pointed out that the Eight Principles given by Jesus through His Sermon on the Mount show the path to holiness. 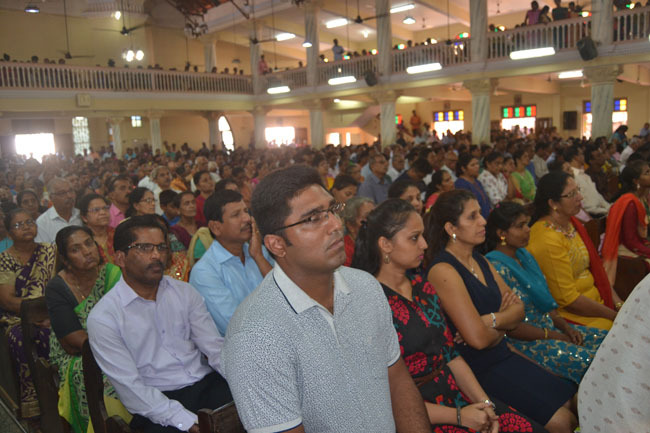 There are many opportunities to follow the path shown by Jesus to attain holiness. 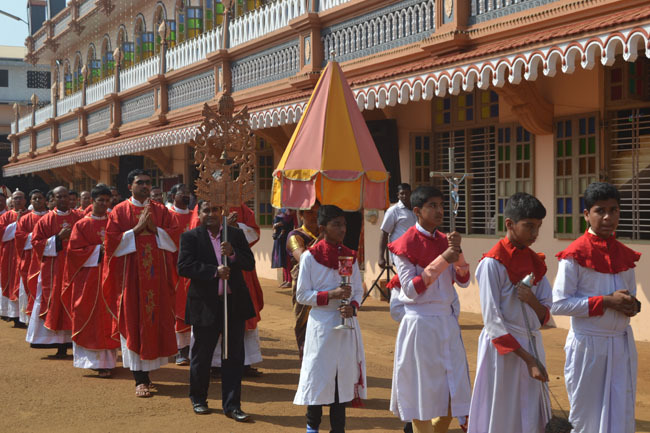 The Bishop further said that every person’s life is a Way of the Cross. 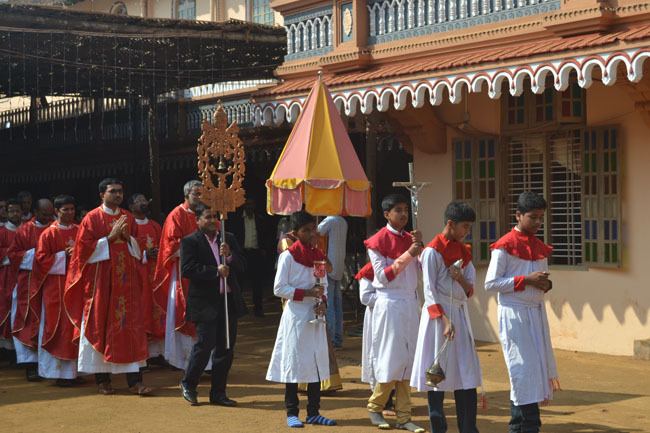 If one carries the Cross alone, he would feel the heaviness of the Cross, but if he carried his Cross with Jesus, he will find it light and easy. 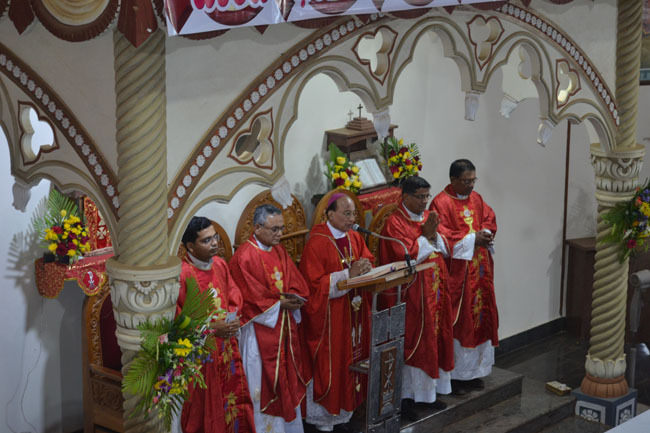 Bishop Gerald Lobo continuing his homily sais that to attain holiness or sainthood one need not do great things, but can do small things in great way pleasing God. 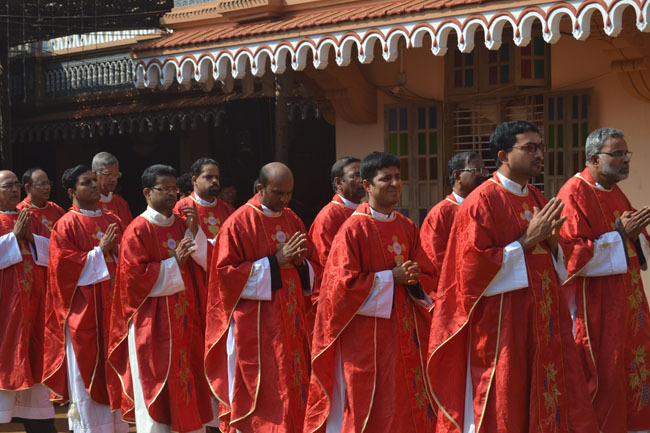 Being committed to ones vocation, doing good to others in any capacity that one serves and following the principles preached by Jesus one can attain holiness. 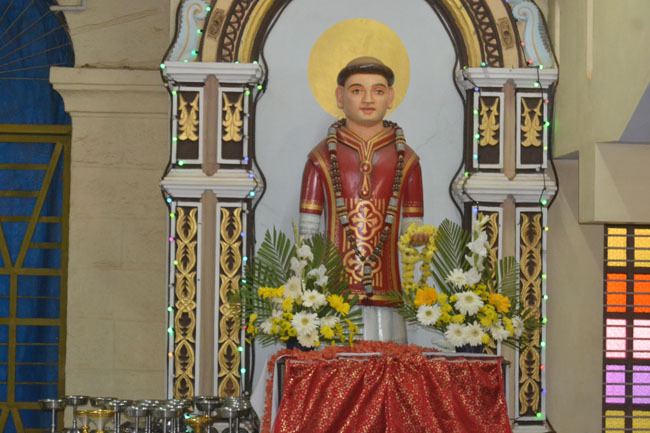 Referring to the life and martyrdom of St. Lawrence Bishop Gerald Lobo said that St. Lawrence served the poor and marginalized and attained martyrdom and sainthood. 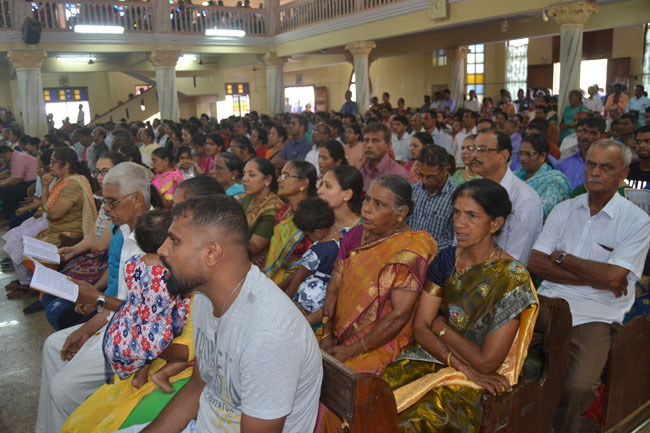 At the end of the festal mass, Rev Fr George D’Souza-Rector of St. Lawrence Basilica conveyed greetings to the parishioners on the occasion of their annual feast and feast of Our Lady of Guide. 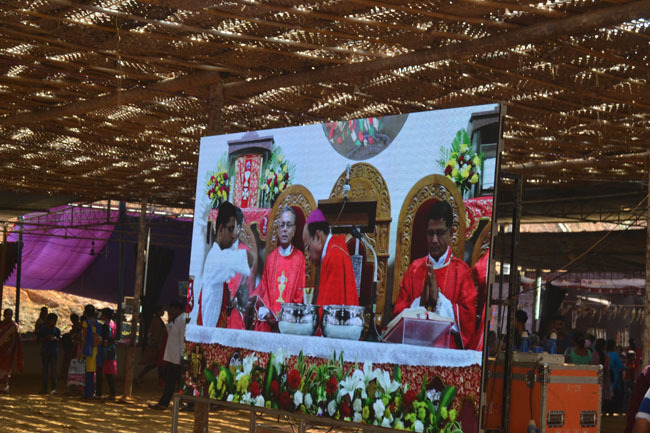 He also expressed thanks to Bishops and priests who concelebrated feast masses during the five days long annual festivities of the Basilica. 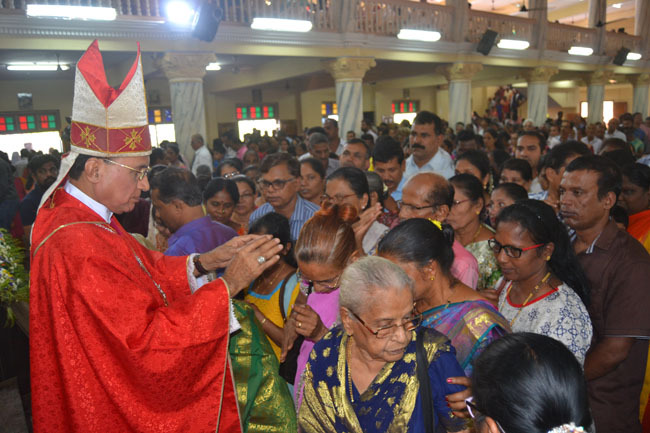 He also expressed gratitude to all those priests and volunteers who were in charge of different departments, choirs from different parishes, security personnel and all those who have been serving in the Basilica throughout the year. 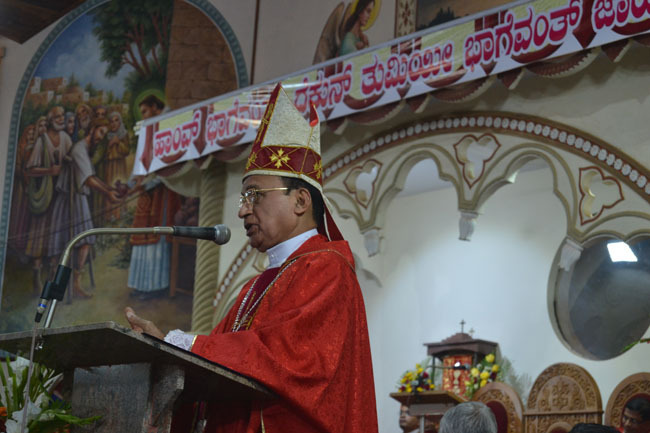 Bishop Gerald Isaac Lobo expressed his gratitude to Rev Fr George D’Souza-Rector of the Basilica who has been working hard to provide various basic infrastructural facilities to the pilgrims coming from different parts of Karnataka. 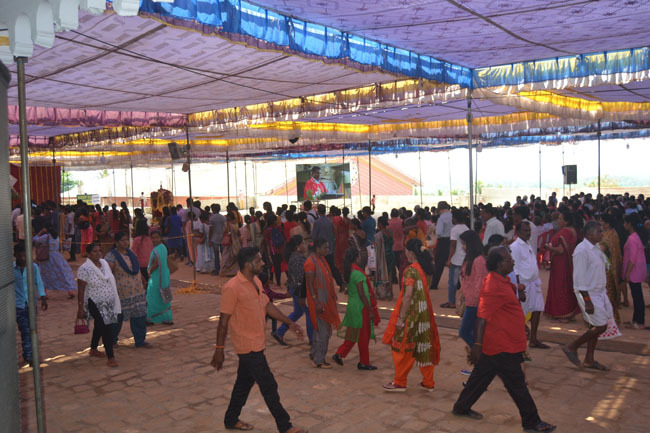 He said that the facilities are incomplete and still a lot of work is to be done and sought prayers and support from the devotees. 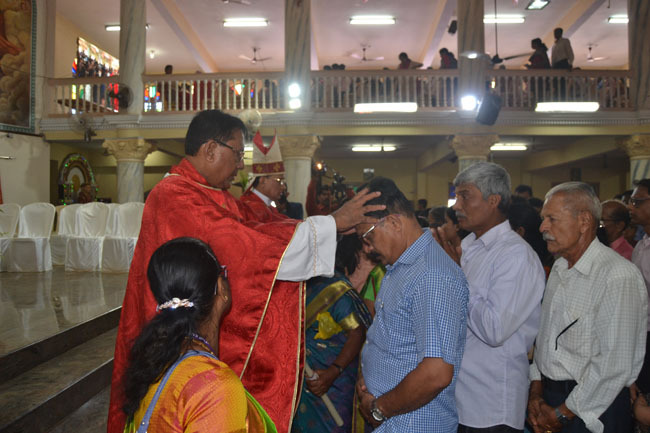 Following the final prayer for the sick and solemn blessing, the Bishop along with other priests prayed for the devotees by placing their palms on the heads of each and every devotee. 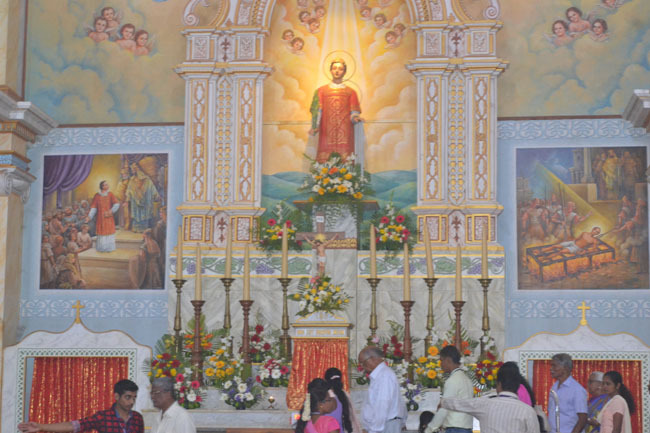 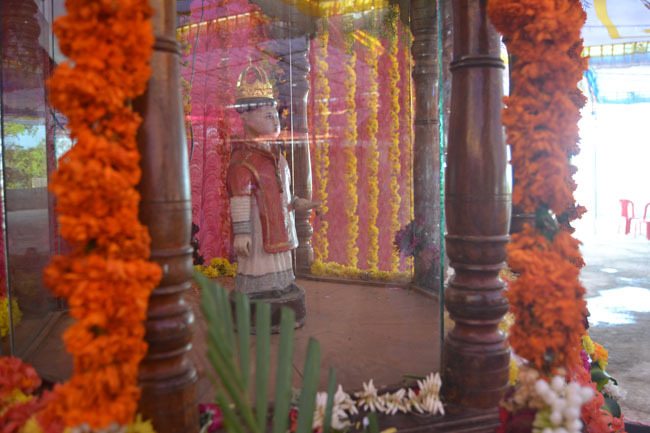 A large number of devotees were seen lighting the candles, and queuing up to venerate the relic and miraculous statue of St. Lawrence. 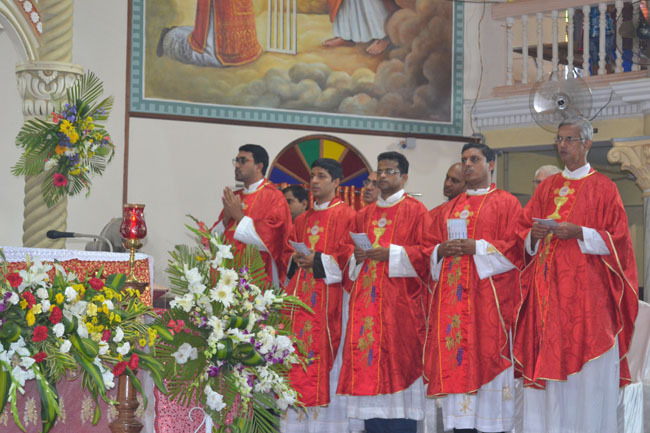 The five days long annual feast of St. Lawrence Basilica will end with final feast mass at 9.30 pm on Thursday, 31 January 2019. 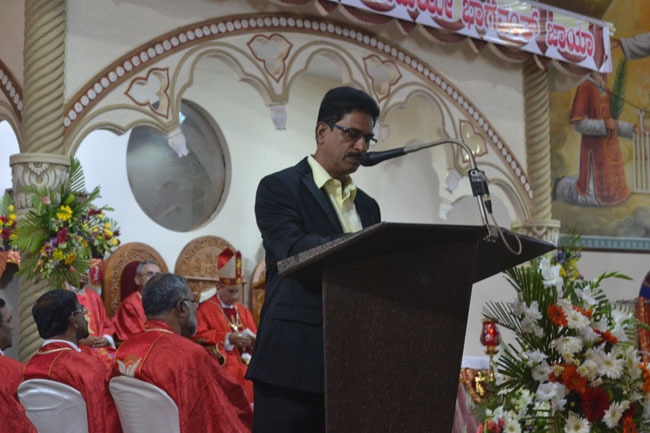 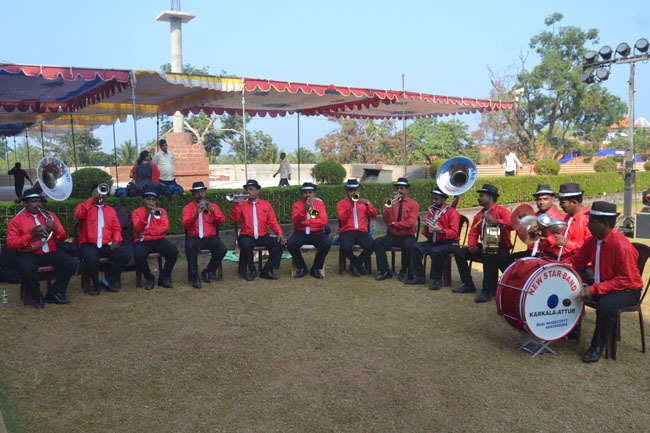 It is interesting to note that Praveen Castelino from Moodubelle along with his brother Roshan Castelino of Best Caterers has been managing the day to day support service such as providing breakfast, lunch, tea and snacks and dinner to around 1000 personnel including priests, volunteers and security personnel during the five days long annual feast since the last 19 years at St. Lawrence Basilica. 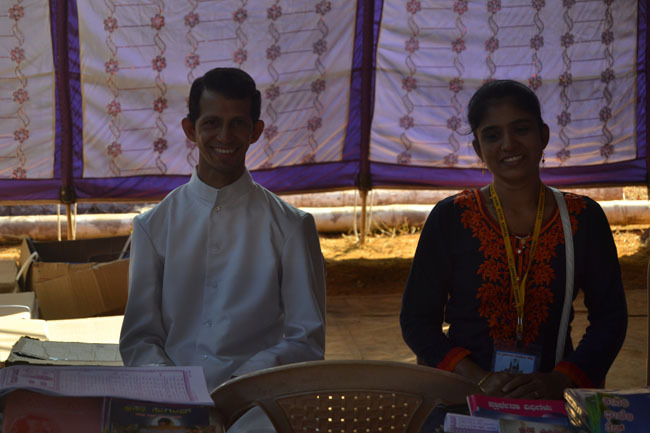 With a team of dedicated workers, Praveen and Roshan Castelino have been the backbone of the support service at the Basilica. 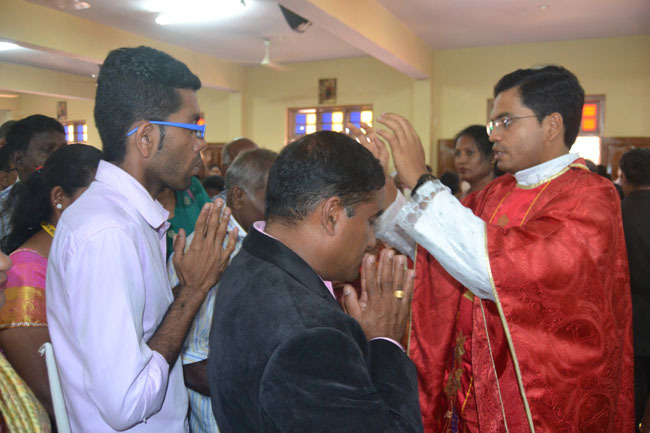 Hearty Congratulations to Praveen and Roshan Castelino brothers for their noble and selfless dedicated service in the foot steps of St Lawrence which every faithful should emulate. 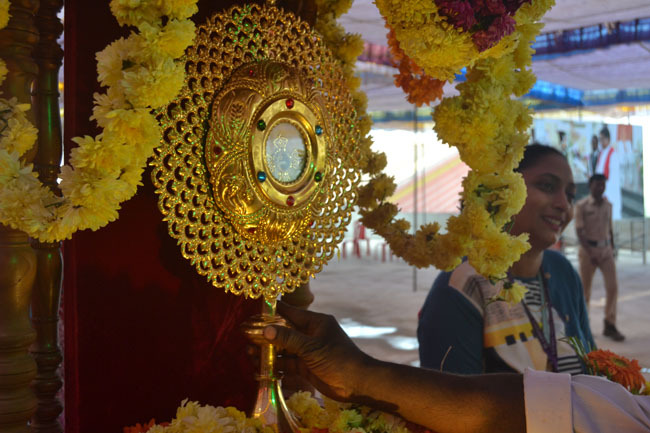 More we sow more we reap and may God bless these brothers and every one serving in the wine yard of Lord Jesus. 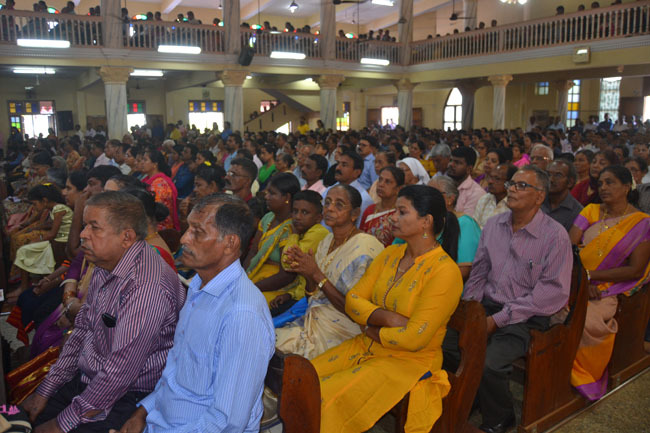 Wonderful report and pictures. 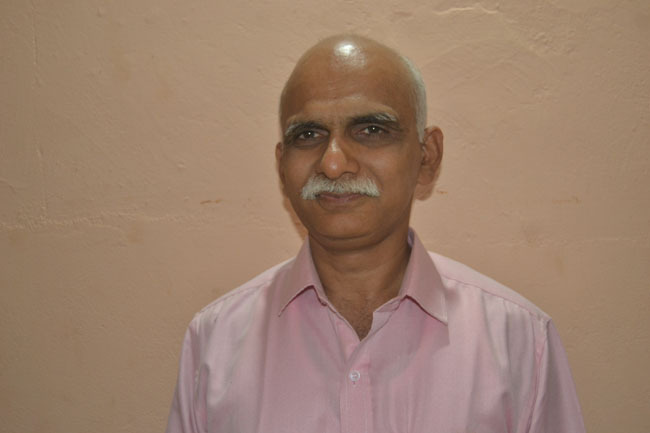 A big thank you to Dr. Eugene.